Unless you are a headphone audiophile, you are handicapped by the room you listen to music in. I was faced with the dilemma of listening in an acoustically poor space. Others may disagree on this, but I feel that the room has at least as much to do with sound reproduction as any other component. I had a 3.5 by 4.5 m unused space, so after convincing the spouse that an extra room would be nice, I got out my tools and went to work. What I do want to relate is some of the planning and features that make a space better for audio. I decided that there were some key factors that would affect my listening pleasure. In no special order, they are room resonances, sound reflections, background noise levels, ugly wires dangling everywhere (like my old room), power considerations, ease of making changes, and general comfort. The first step was to search for information on room resonance, for which there is plenty of information available. Basically, the length and width of my room were OK, but the ceiling was problematic, as it was too low. As luck would have it, the roof over that section of the house is sloped. If I changed from a level ceiling to a sloped one that followed the roof line, the situation was much better. The slope is about 15 cm across the length of the room. I feel it is necessary to mention, that it is probably impossible to have a space (in a normal house) that doesn’t have some resonant frequencies and some nulls. The next step was to damp out reflections. This was accomplished using a thick carpet with a thick under pad, acoustic ceiling tile, wall coverings and overstuffed furniture. Clearly you don’t want to get rid of all reflections, just the excess ones. You might ask which ones are they? Well, they are the ones that make music and voice sound strange to you. So how much damping you use is a personal thing. In my case, the main speakers (Parts Express Aluminum/Silk Dayton MTM) tend to sound best about 10 degrees off center. The floor was made extra sturdy out of 2 cm exterior grade plywood. Joists were on 45 cm centers with concrete supports every 60 cm. The floor is solid and non-resonant. To cut down exterior noises and further reduce the possibility of resonances, the walls and ceiling were stuffed with insulation. One thing that I think is very important was that nearly all the construction was done using 10 cm “deck” screws. This makes a very strong structure that can be easily disassembled later. Another hint is to use many screws. It will save grief later when you discover that something resonates. All heating and cooling equipment is located out side the room to cut down ambient noise. All wiring was installed overhead above the ceiling. In each corner I installed a section of foam pipe insulation to use as a conduit to the floor. It works like a champ to hide the wires and you can easily add or remove wires. Having enough electrical outlets was always a problem in the old room. I installed several above the ceiling and had some remotely switched. Concealed lighting and central power switching was also installed. I have a separate 120 VAC power feed to the room (20 amps), a dedicated 12 VDC supply that comes from a trickle charged 85 amp-hour deep cycle battery, a FM antenna drop, a CATV drop and provisions for a 120VAC UPS. In the past, I had equipment scattered over several shelves and interconnects tangled every which way. So to solve that, I built a single shelf above the HDTV and speakers. All the equipment is in a single line and with careful placement, all the interconnects are short and untangled. As a side benefit, the high shelf helps conceal the wiring and keeps kids and short people from messing with it. The only difficulty I have encountered is loading discs into the DVD / CD player. If you look at the HDTV mount photo you will see it is a DIY job, as I was appalled at the price of HDTV wall mounts. It consists of two small blocks of wood, a cross piece of wood and two metal pipe hanging brackets for a total cost of about $6US. The brackets fasten to the holes in the rear of the TV and are folded over at the top to hang on the cross board. My turntable is just on the other side of my half height dividing wall (partially visible in the construction photo). It sits on 8 full size concrete blocks (20 X 20 X 40 cm) on a concrete floor. The wiring is a bit longer than I would like at 2 meters, but the arrangement is as solid as you can get. There are some things I didn’t do, and some I may still do. I originally planned to build in the home theater (HT) 5.1 speakers. I planned to use Fostex FE126E speakers for the front, rear and center speakers and a pair of 38 cm subs to go with them. I built spaces in the walls for them, but have not use them (yet). If you look at the finished rear photo, the rear HT speakers (Radio Shack ceiling speakers 17 cm woofer and 2.5 cm tweeter) are hidden behind the picture frames. 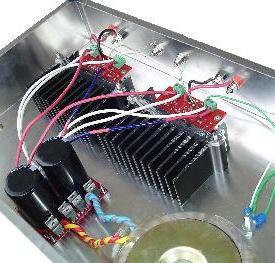 Power to the subwoofers is controlled by a DIY electronic relay control from the HT amp. I am using a pair of DIY Dayton BR-1 bookshelf speakers from Parts Express for the fronts and an Infinity MTM for the center. So, how does it sound? Very well, in my opinion. The detail is excellent as is imaging, there is a wide soundstage, with quiet background and the overall tonal balance is slightly warm. That is my preference and may well be a result of my use of a modified K-12 tube amp to drive the MTMs. You may have noticed that the MTMs are above what would be considered a standard height. This is also a personal preference as I like a sense of having the performers on a stage and this placement aids in the illusion. With the subs in the corners, there is considerable room gain as would be expected. This could pose serious balance problems if uncorrected. I handle it by using an active crossover with a 24 dB / octave slope. The crossover frequency is set at 50Hz and I use a separate amp for level control. I still have some fine tuning to do but the results are already worth the trouble. Several things could go wrong with a project like this, the biggest being excessive room resonances and reflections (too few or too many). Loose wall panels that might vibrate could also detract from the listening experience. Bad ergonomics would certainly detract as well. I wanted a comfortable place to enjoy music and as a side bonus, the wife likes it too. Looks like a very relaxing room. Could you share with us some more information about the room resonance and how a sloped ceiling helps room acoustics? Excellent job Bruce. I'm glad it turned out as well as it did! Bruce provided me with some of the links he used for Room Resonance and I have added them to the post. Thanks for your comment. Yes it is quite comfortable and your question is excellent. The research I did indicated that resonances were greatly reduced in non-parallel rooms. It seemed reasonable that it would apply to the floor to ceiling combination as well. The original plan for a flat ceiling according to the formulas would be terrible. There would be multiple nodes in key frequency ranges. Having a sloping ceiling composed of acoustic tile (about 1 in 10 slope) and using highly absorbent carpet with a thick cushy pad apparently worked as expected and substantially cut down the resonances. I can’t prove it with the math, but it worked for me. To cut down reflections I used a scattered pattern of wall coverings and overstuffed furniture. I will make some measurements in the not to distant future, but my ears tell me that there are no significant peaks or dips at my listing spot. If you want a more detailed answer, email me at gofar99@hotmail.com. The Pixel Buds are housed in a clamshell casing that also functions as its charging base. It’s simple yet convenient, allowing you to preserve your headphones well no matter where you cross @the0cean/best-google-assistant-headphones-bb3616871ada. If, like me, you suffer from ear pain when using headphones then check out my post here.